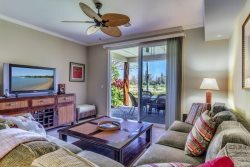 Waikoloa Beach Villa with 3 Bedrooms, Sleeps 8, Hilton Waikoloa Pool Pass thru 2019, Billiards Table, Swimming Pool & More! Luxury Living for the entertainer can be found at this Waikoloa Beach Villa that features three bedrooms, three full bathrooms, and accommodates up to eight guests. There is an uninterrupted flow between the living and dining area making entertaining easy. The living room boosts a large flat screen TV and a surround system. The gourmet kitchen is fully-equipped with high-end appliances and all the cookware needed to help create a delicious meal. The dining seats six with additional seating for four more at the breakfast bench. Adjacent to the dining area is a game room with a billiards table. Just outside the living room slider on the lanai is an outdoor kitchen with BBQ for your enjoyment. Steps away from there you will find the cabana, pool and hot tub. "Waikoloa Beach Villas" is a gated community located across the street from Queens' MarketPlace and next door to The Kings' Shops. Two of the bedrooms are master suites. The king bedroom has a flat panel TV, private lanai, walk-in shower, bathtub and double sink vanity. The second master suite has a queen bed and private bath with tub/shower. The loft has one full futon and an entertainment area with TV. Linens are provided for your comfort. Our unit is well appointed with everything you will need to make your visit just perfect. A completely stocked beach locker with beach chairs, boogie boards, ice chests and beach towels. Just a quick stroll to the very popular 'Anaeho'omalu Bay (A-Bay) for lots of beach activities. Just a few steps away is the Queens' MarketPlace and the Kings' Shops. We loved our rental. Our only difficulty was trying to get two full loads of towels washed before we left. The dryer seemed slow to dry so the only way to get two full loads done was to get up earlier or start the night before and then do without towels the next morning. As stated above, thoroughly enjoyed working with Kim, who was available by text to help us make the most of our stay. This type of customer service is why people come back. The property is nice but without good folks who show they care about the folks they are serving it would not have been the same kind of positive experience. Good Job Kim! Great stay at the Beach Villas. Wish we were still there! Everybody was so helpful and very friendly. We had so much fun and everything was great. The only thing I would suggest is new sand toys as they had seen a lot of wear plus the scuba gear needed replacing. Some of the foot gear was broken and most of the goggles were leaking or broken. Otherwise we couldn't of asked for anything more!!!! The only problem we had was with the gate entry code which quite often didn't work and we were fortunate enough to have another guest arrive behind us and automatically open the gate with a remote. We think that this could be improved. Your team promptly answered our questions, was courtious and helpful. We loved the property and location and plan to visit again next year!